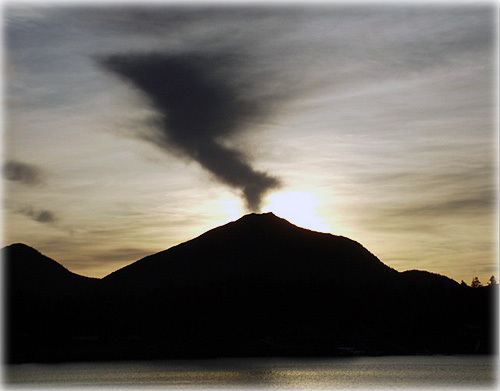 A cloud viewed from City Dock gives the appearance of a “smoking volcano” on Gravina Island just south of the Airport. 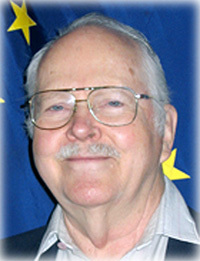 Ketchikan: SHAY: Fifty Years of Politics, Plays, And Puns A Feature Story By DAVE KIFFER - It’s hard to imagine Ketchikan public life without Jack Shay. BEN BOYCHUK and JOEL MATHIS: Has airline security gone too far? - It's been a bad couple of weeks for the Transportation Security Administration. A U.S. Senate subcommittee on Wednesday grilled top TSA officials about air travelers' concerns and complaints over new full-body scanning procedures and aggressive pat downs and frisking at U.S. airports. The hearings followed an incident last weekend, when a California man recorded a confrontation with TSA agents at San Diego International Airport. TSA officials said this week they would investigate John Tyner, who posted video of himself on YouTube telling an agent, "If you touch my junk, I'll have you arrested." Tyner could face jail and an $11,000 fine for allegedly failing to complete security screening. Have security measures gone too far? How should Congress rein in the TSA? Ben Boychuk and Joel Mathis, the RedBlueAmerica columnists, weigh in. If I had my druthers, I'd abolish the Transportation Security Administration, jail its administrators and exile its agents to North Dakota. But I'd settle for Homeland Security Secretary Janet Napolitano's resignation and for Congress to simply "zero out" appropriations for these invasive, full-body scanners that have many travelers rightly outraged. And instead of investigating citizens like John Tyner who stand up for their right not to be groped, Congress should be investigating TSA bureaucrats who openly violate those rights. Napolitano and her allies in Congress, such as Sen. Joe Lieberman (I-Conn.), would have Americans believe their liberties and personal dignity is nothing compared with the terrible toll a terrorist could inflict without such invasive measures in place. Kyle Johanson Should Resign By Robert Thompson - At the meeting with District One Republicans our representative, Kyle Johanson, encouraged folks to call him - of course, he doesn’t bother to answer his phone. Kyle J. said he is willing to meet with anyone. Yet no one seems to know where he is or how to get a hold of him. - More..